This is an introduction to physics for the lay reader. 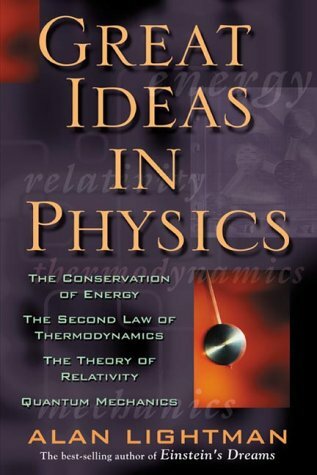 The text takes the reader through four important ideas in physics: the conservation of energy, the second law of thermodynamics, the theory of relativity and quantum mechanics. science. He explored astronomy, cosmology, particle physics, space exploration, and the life of a scientist, writing about these topics in a way that makes them understandable to the average reader. Many of his essays can be found in the collections Time Travel and Papa Joe's Pipe and A Modern-Day Yankee in a Connecticut Court and Other Essays on Science. Alan Lightman is also the author of "Ancient Light: Our Changing View of the Universe", which won the Boston Globe's 1991 Critics' Choice award for non-fiction; and co-author of "Origins: The Lives and Worlds of Modern Cosmologists", which received an award from the Association of American Publishers in 1990. In the 1990's, Lightman branched out into fiction, although still with a focus on science, with the novels "Einstein's Dreams" and "Good Benito."